Your living room is one of the most used rooms in the house so it’s very important to create a lighting scheme that isn’t restrictive. Doing this will allow you to use the room for entertaining, film nights or just relaxing with a good book. In a previous article we spoke about the three main types of lighting, and to create that perfect living space all three types should be used. Ambient lighting: The main ceiling light provides you with a great opportunity to build on the style and décor of the room. Pendant and chandelier lights are often popular as they look impressive even when the light is switched off. Make sure the main light is controlled with a dimmer switch so you can reduce the amount of light for watching TV and prevent glare on the screen. Accent lighting: A living room is often filled with pictures and ornaments that reflect our lives and share fond memories. 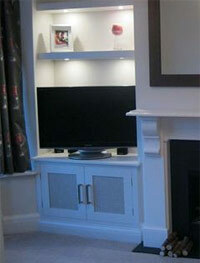 In addition they often have architectural features such as fireplaces or alcoves which can bring interest to the room. These can be highlighted and turned into focal points by using either permanent fixtures such as wall lights or downlighters, or (and I would say our preferred method due to their flexibility) floor and table lamps. Make sure they produce a mixture of downward and upward light, so the warm glow they produce can reflect back into the room off the walls and ceiling. 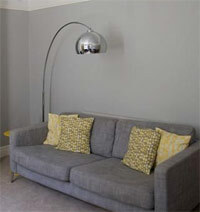 Task lighting: floor and table lamps can also become part of your room’s task lighting. If you want to sit on the sofa and read then these can provide the additional light you need so you don’t strain your eyes. It’s important to be practical with how you position one or two of your lights. For all lights in the living room it’s best to use light bulbs which give off a warm colour temperature so the light adds to the relaxing atmosphere of the room. A cold white colour could feel too clinical.